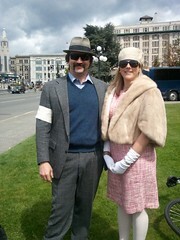 Posted on September 30, 2013 by Tweed Ride Victoria Posted in Uncategorized	. Margaret Hanson Design Co. has been with us every step of the way, year after year. She designed the logo in 2011 and has come up with a new poster design and promotional materials each year to keep us looking spiffy. She has donated all of her talented and creative services, and we are truly grateful. You’ve likely seen her creative flair on many things including event promotional materials, as well as logos and branding for wine, beer, wine chocolate and tea companies. We have worked with Margaret on other projects and she has been a delight in every regard. Thank you, Margaret Hanson Design! 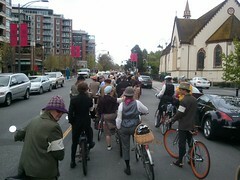 Posted on September 29, 2013 by Tweed Ride Victoria Posted in Uncategorized	. There are volunteers, and then there are Volunteers. 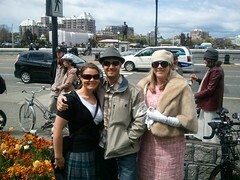 The Tweed Ride Marshalls fit into the second category. 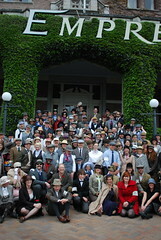 They have been supportive, enthusiastic, committed and capital Jolly Good Fellows who have been crucial to the smooth-running of every Tweed Ride since we began in 2011. And this year was no exception. 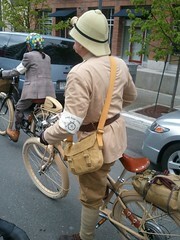 We are honoured to have had such fine men with us on this fine endeavour. 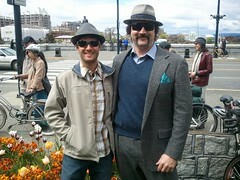 Posted on September 28, 2013 by Tweed Ride Victoria Posted in Uncategorized	. 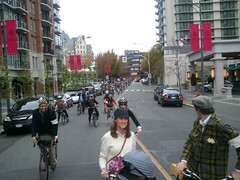 For those of you not riding today, you will find us at the Roundhouse at Bayview Properties. The corner of Sitkum Road and Esquimalt Road in Songhees. 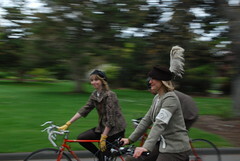 …but Tweed Riders don’t need to ride in strong winds and heavy rains. The weather has actually advanced from yesterday’s predictions and is now set to get worse, not better, as the day progresses into the Official Ride start time of Noon. That being the case (and after standing in the rain for 5 minutes and getting soaked through my Tweeds you will discover why) we are transmuting the Lead of this weather into the Gold of a Tweed Rally at the Roundhouse. 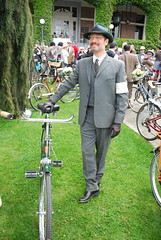 Tweed Rider (and the Sane) may make their own way to the Roundhouse via automobile, Public transit, bicycle or on foot, to join us at the Roundhouse to picnic and hot tea indoors in a dry and convivial atmosphere, at 12:30. Spread your blankets, open your hampers, fill your cups, and join us in the semi, hemi, demi, al fresco of the handsome Roundhouse Car Shop. The choice is entirely your, dear Riders…. Just a note – there are no washrooms in the building, but the Lawn Bowling have kindly offered their support and are welcoming Tweed Riders to avail themselves of the Club’s water closets. 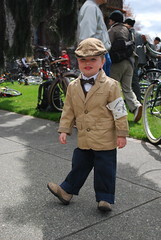 Hope to see you at the Roundhouse – Lord Knows we will need a cuppa by then…..
Posted on September 24, 2013 by Tweed Ride Victoria Posted in Uncategorized	. 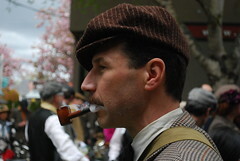 Tweed Spirit is an ephemeral thing. Is it having a Smart Bike? Is it Excellent Accessories? 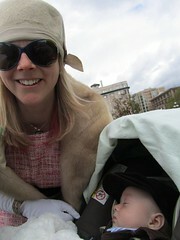 Is it having a beautiful cloche? The way your tie matches your houndstooth? A certain kind of Presence? 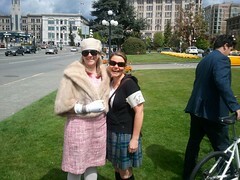 Posted on September 21, 2013 by Tweed Ride Victoria Posted in Uncategorized	. 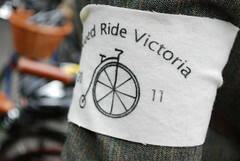 In previous years Tweed Riders have enjoyed a Jolly Good cuppa at the Ride. And this year will be no exception to that Fine Old Tradition! 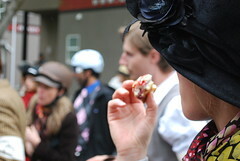 We are delighted to announce that Victoria’s Very Own – Murchie’s Tea – will be sponsoring this year’s outing with a selection of blends from the Farthest Corners of the Globe to Titallate and Pleasure the cultured palates of our Tweed Riding Connoisseurs.